TROPICAL cyclone Idai continued to wreak havoc in eastern Zimbabwe, with authorities announcing more than 82 bodies had been recovered as of late Sunday. 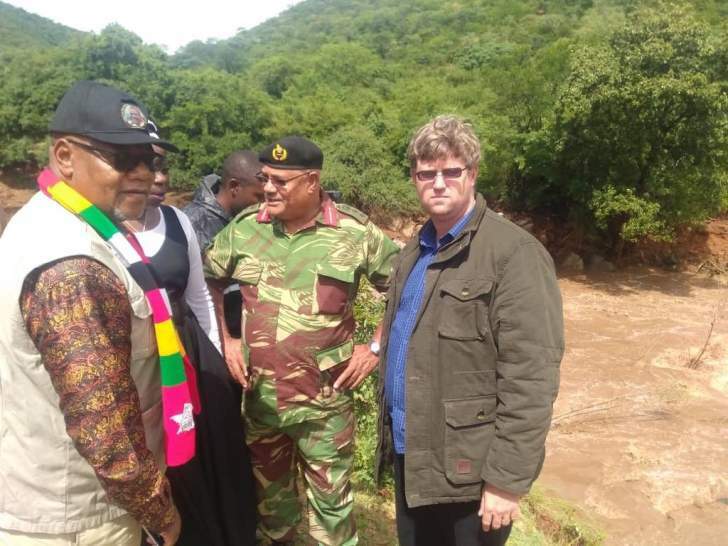 Chimanimani and Chipinge districts south-east of Mutare, in Manicaland, seem to have borne the brunt of the catastrophe with gory images of the devastation showing bridges washed away and roads impassable. Local Government Minister July Moyo told reporters at a press briefing in Mutare that authorities expected more bodies to turn up. "The death from what we have been advised now has risen from 31 to more than 65. Some bodies have been retrieved floating in rivers and a lot of people have been reported missing. "While we hope that some people who have been trapped are alive, it is also likely that some might have unfortunately lost their lives," said Moyo. But according to the Civil Protection Unit's provincial head Wilson Boore, the death had reached 82. Local MP Joshua Sacco said the situation was a "humanitarian crisis". Government spokesperson Nick Mangwana said rescue efforts have begun. "We now have helicopters picking people and we will have a better idea of the extent of damage and devastation in due time. The weather is breaking now and visibility is better," Mangwana told NewZimbabwe.com. Moyo revealed that most mortuaries in the province are not working once again pushing the spotlight onto the country's desperate health delivery system that has been in the eye of the storm with doctors describing it as a "death trap". "Our mortuaries are not working but the police and medical personnel are here. Solutions will be found," the Cabinet Minister said. President Emmerson Mnangagwa announced he was cutting short his trip to the United Arab Emirates in order to personally deal with the situation at home. "HE President Mnangagwa has shortened his visit to the United Arab Emirates (UAE) to make sure he is involved directly with the national response by way of relief to victims of cyclone Idai. HE has incorporated in his schedule a plea for assistance for cyclone victims," the Ministry said in a short statement on its Twitter account. It is the second time inside three months that Mnangagwa has been forced to rush back home after his four nation tour of EuroAsia in January was cut-short by deadly riots that claimed 17 lives. However, it was not immediately clear when the President would arrive in the country. Government has declared the situation a state of disaster. According to Moyo, well-wishers, among them, a local businessman who donated 10 litres of fuel as well as international organisations such as the United Nations International Children's Fund (Unicef) and Medicines sans Frontiers (MSF) have come forward with assistance. "We continue to seek assistance to help with the immediate needs of those trapped and marooned as well as families that have lost loved ones. "Government as usual will provide RTGS$1000 plus transport for the burial of the deceased and a coffin to make sure the process is as hassle free as possible for the bereaved," said Moyo. While Moyo could not give figures of those trapped or marooned, reports have claimed hundreds are unaccounted for with whole villages having been swept away in areas surrounding Chipinge. Most parts of Zimbabwe's eastern border with Mozambique have been hit by the peripheral effects of cyclone Idai but statistics suggest the country could have the highest toll in the region. The adverse weather phenomenon has also hit Mozambique and Malawi to the north.